Speaking of the 2012 Food and Wine Festival (because really, you’re currently either talking about that or the Fantasyland expansion), we should venture over to the Festival Center and explore some hidden vegan eats featured this year! Located in the Wonders of Life Pavilion, the Festival Center is buzzing with all things food and all things wine throughout the Fall months. This year, the Festival Center features the Chase Lounge (where there is not one chaise lounge, which is a missed opportunity in my book) for those who have a Chase credit card. Here, you can get wristbands for priority seating for the Eat to The Beat Concerts, and also wristbands for entrance into a special Illuminations viewing area. Also, the lounge features complimentary coffee and soft drinks, along with a big touchscreen map of the park. Pretty cool! Throughout the Festival, there are a number of talks, seminars, and demonstrations that take place throughout the day, everyday in the Festival Center. If you find yourself visiting for any of these reasons, I’d like to direct you over to Intermissions Cafe, the coffee and snack counter on your right as soon as you descend the ramp at the entrance to the building. Intermissions Cafe showcases a number of different champagnes and wines, but also has some quick meal options including something called a Vegan Trio. There’s that word again! Am I dreaming? Is the word “vegan” finally becoming part of the WDW menu vocabulary? I certainly hope so! 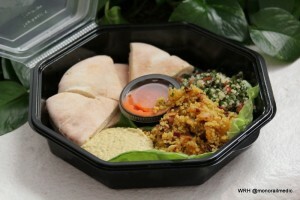 The Vegan Trio costs $6.75 and would be great to share as a snack, or have all to yourself for a light meal. The platter includes: couscous with raisins and almonds, tabouleh, hummus, a roasted red pepper puree, and pita bread. The winner here is probably the roasted red pepper puree, but the whole dish is great. It also comes in a re-sealable container, so you can take it with you and save some for later if you’d like! It’s so good, reasonably priced, and I highly recommend checking it out. It’s so nice to have this other option as an addition to the Food and Wine Festival this year at Epcot. It seems that the components of the Vegan Trio are all things they serve elsewhere in the park, just not necessarily together in one platter. It would be great to see this option stick around, and hopefully become available in more quick service locations throughout property. If you find yourself in the Festival Center, not on a chaise lounge, give this trio a try-o! Thank you, Emily! That is certainly something we would enjoy, but would probably not have stumbled upon. I had a quick visit to F&W on September 30th. I made a point to stop by the Terra booth. Tried the Chili Colorado and loved it–even though I’m more of a fan of veggies and not particularly a fan of meat substitutes. This was very good with yummy flavors and textures. We’ll be back for the real deal November 1-5. Hope to see you at the 3D party that weekend! I’m so glad to hear you enjoyed the Terra booth! Yes, I was really surprised to find this option, too! I’ll definitely be at BabyCakes table at the 3D party! Please come by and say hello! This is great! I hope this is the start of incorporating vegan options into QS locations and labeling them as such. It would be wonderful to be able to purchase something without asking to speak with a chef or look at a binder! Enjoying reading your blog posts! Yes! It seems like such an easy thing to start offering on a regular basis, I hope they do! Thank you for sharing this! We will be there for the last day of F&W and are looking forward to supporting Terra. Will hit this one too! I thought it seemed as though there were fewer veg and vegan options at the other booths this year looking at the menus. Hopefully Terra stays busy and next year more veg options are included at F&W and in the rest of the parks! I’m glad you’ll make it to F&W before the end of the Festival! I’d love to hear what you think about this option, and Terra. Enjoy!